With a fresh face and a new base trim, the Avalon Hybrid adds some funky features to maintain a strong presence in the executive sedan segment. The Avalon Hybrid has enjoyed an astonishing 40% owner-retention rate thanks to impressive efficiency, comfort, and a surprising amount of fun behind the wheel. While attempts to “sport” it up via a stiffer suspension in the previous generation were met with a lackluster response, things are back to normal, and everyone seems to be happy once again. This year, a new grille is matched with some redesigned lights front and back, a new base trim replaces the now-defunct Touring trim, and the Entune system gets a bit of a spit-and-polish as with the rest of the Toyota lineup. Sitting in the driver’s seat of the Avalon Hybrid, it’s easy to forget this is a Toyota. Especially in the Limited trim, which I got to enjoy over the course of a week in January, you’re surrounded by leather and chrome, and it’s really not until you notice you’re staring at the familiar Entune system or the switchgear that you’re reminded of its heritage. In fact, there are a lot of surprises with the Avalon. For an executive sedan, it’s only 4 inches longer than the Camry at 195 inches total. And while the hybrid batteries add 100 pounds to its curb weight, it still weighs in at only a little over 3,600 pounds. 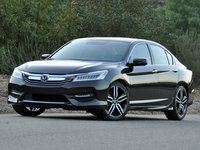 With most of that added weight in the back, it provides a solid, balanced feel that's more than a little confidence building — a funny thing to say for a hybrid sedan. Say what you will about the Avalon's styling or performance, you can’t argue with a 40% owner-retention rate. The fact is, people really love this car, despite its not really standing out in any particular category. It’s 7.7-second 0-60 time isn’t class-leading, but it’s quick. Its 40 mpg combined fuel economy is a similar showing, and I had several people ask me if it was a new Camry over the course of the week I drove it, which says a lot about its styling. Really, it’s a testament to how doing everything competently can make you stand out in your own right. For the Limited trim of the Avalon Hybrid I enjoyed, a current MSRP of $41,950 was bumped up by a sole option of Toyota Safety Sense ($500), which added a pre-collision system with pedestrian detection, lane-departure alert with steering assist, auto high-beam adjust, and dynamic radar cruise control. With a delivery fee of $835, its total price came to $43,285. The Avalon Hybrid utilizes the familiar 2.5-liter inline 4-cylinder/electric motor combination we’ve seen in other Toyota hybrid offerings, such as the Camry and the Lexus ES 300h. Here, it’s a 244.8-volt nickel-metal hydride (Ni-MH) battery pack that provides the juice, with a reported combined total of 200 hp. Now that’s a misleading figure, as it’s hard to express the power output from two separate but cooperating systems. Breaking it down, the 2.5-liter gasoline engine itself is good for 156 hp at 5,700 rpm and 156 lb-ft of torque at 4,500 rpm. However, the difference is felt from the electric motor’s 199 lb-ft of torque on tap from 0-1,500 rpm, which provides a healthy push right where most inline fours fall flat. It’s instant acceleration, and it actually can be a bit of fun. Once you get up into the rev range, it’s capable of delivering an additional 141 “electric” horsepower at 4,500 rpm. Somehow, this all adds up to 200 hp. More importantly, it means the gasoline engine doesn’t have to work as hard to provide power and therefore can be more efficient. 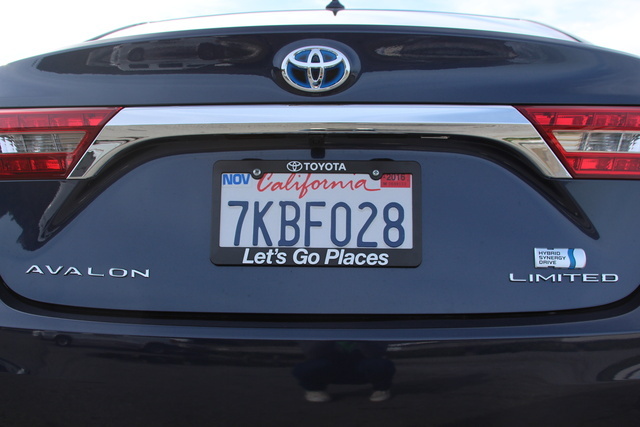 Specifically, the Avalon Hybrid is rated by the EPA to deliver 40 mpg city and 39 highway. If you don’t care so much about saving a few extra dollars at the pump, there’s a Sport mode that will cause the two-speed CVT to mimic gear changes and hold revs higher, as well as quickening the steering response. I admit to using this mode frequently, and it certainly had an effect on my overall mileage. However, with a nearly 700-mile range thanks to a 17-gallon fuel tank, I didn’t even come close to running out. Even after hundreds of miles over the course of the week, I barely broke past the three-quarter mark on the fuel gauge. One concern is with the purported ability to drive under electric-only power at speeds up to 25 mph for over a mile. I was never able to reproduce this, as the gasoline engine would repeatedly kick in at much less than 25 mph and after going only a few blocks. This happened even on flat ground, but when any sort of incline was encountered, the all-electric power party was immediately called off. 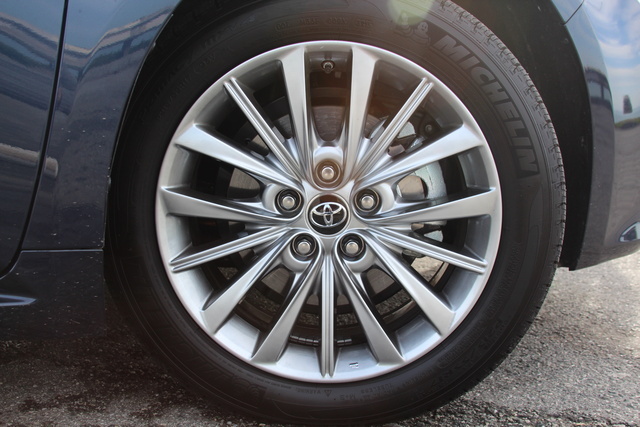 Additionally, the low-rolling-resistance tires the Avalon was fitted with perform quite poorly in wet conditions. I didn’t notice this in the usually-dry Bay-area weather, but as soon as the rain started, all that torque down low combined with the hard rubber that provides a couple more miles per gallon meant a lot of tire spin. Give it the beans around a tight corner, and 4-wheel slides were even in reach — another testament to the well-balanced chassis of the Avalon, but certainly a safety concern. With the last update, the Avalon’s lines were sharpened for a fresh look that some have likened to European offerings. This I don’t see, but there’s definitely a crisp “feel” to the Avalon’s profile, and with a new “frowning” grille and updated lights front and back, the Avalon has certainly managed to stay current. With more leather and chrome than you’d expect, even with the Hybrid Limited’s inflated price, the Avalon does a good job of putting out a “luxury” atmosphere. This is only helped by a balanced chassis and suspension and well-weighted steering, two elements I’m sure have solidified the Avalon’s notable owner-retention rate. While many hybrids give up a ton of space to make room for batteries, the Avalon Hybrid sacrifices only 2 cubic feet compared to the gasoline version, retaining a full 14 that keep it rather competitive. Likewise, the Avalon offers actual adult seating front and back, with comfortable seats and plenty of room for heads and legs together, a useful combination. Previously, Toyota toyed with the Avalon’s suspension settings, intending to offer a sportier ride to lure a younger demographic. The result was less than positive, and many complained that the very thing that made the Avalon so attractive had been compromised, so Toyota has since reverted back to softer settings. The result is a very pleasant cruise that avoids much of the “boatiness” that can plague larger sedans. Beyond the upgraded Entune system, which now offers smartphone-app integration through the 7-inch touchscreen, the Avalon Hybrid gets a lot of tech along with the additional motor. With the Limited, that list is even longer. Standard features include dual-zone auto climate controls, leather heated front seats with 8-way power for the driver complemented by 4-way power for the passenger. This all comes with the base XLE Plus trim, along with heated mirrors, auto headlights and rear-view, keyless entry and ignition, and a tilt and telescoping steering wheel. 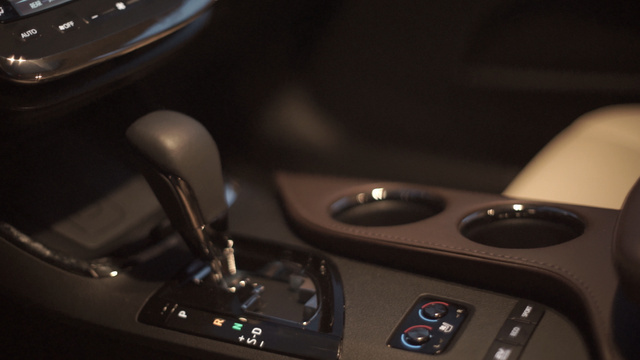 The XLE Premium expands that list with the Premium Entune system, offering navigation, the aforementioned smartphone integration, and a 9-speaker stereo. You’ll also get driver memory settings, wireless smartphone charging, and safety features like rear cross-traffic alert and a blind-spot monitoring system, but for the full package, it’s the Limited that really gets the works. Climate controls are upgraded to tri-zone, front seats gain 10-way power for the driver and 8-way for the passenger along with ventilation, and the rear seats gain heat as well as a power sunshade for the rear window. Side mirrors get power and auto-dimming, and the wipers go automatic as well. 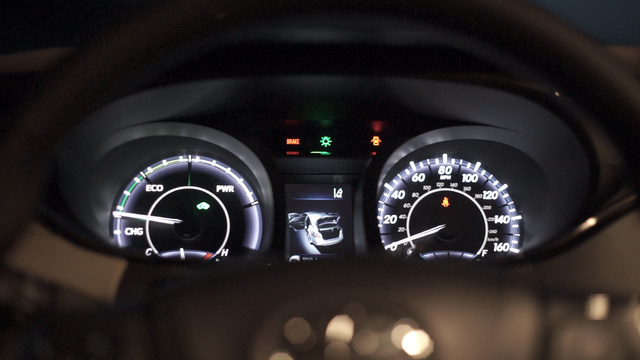 The headlights go to xenon units and are joined by interior ambient lighting, and the stereo gets a bump up to 11 speakers for the JBL premium system. Beyond the optional Toyota Safety Sense system, which is about one step short of guaranteeing you can’t get into an accident, the Avalon Hybrid comes standard with a fine list of safety features. Beyond the usuals like traction and stability control and 4-wheel antilock disc brakes, the Avalon is fitted with 10 airbags, including side curtain and front knee. Average braking distance for a stop from 60 mph has been recorded as a little over 130 feet, which is slightly under the average for the class. The National Highway Traffic Safety Administration (NHTSA) awarded the Avalon Hybrid 4 stars in frontal crashes and rollover tests, but hasn’t awarded ratings for side crashes or overall. However, as it’s largely unchanged from 2015, the previous ratings of 5 stars in those categories should carry over. 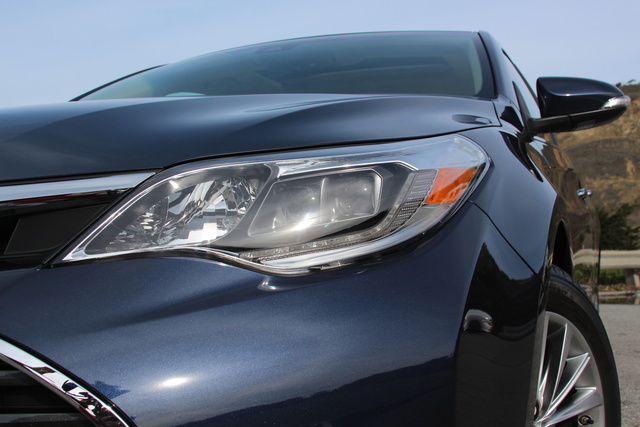 The Insurance Institute for Highway Safety (IIHS) hasn’t yet tested the Hybrid specifically, but has awarded the standard Avalon its top rating of Good in all categories. 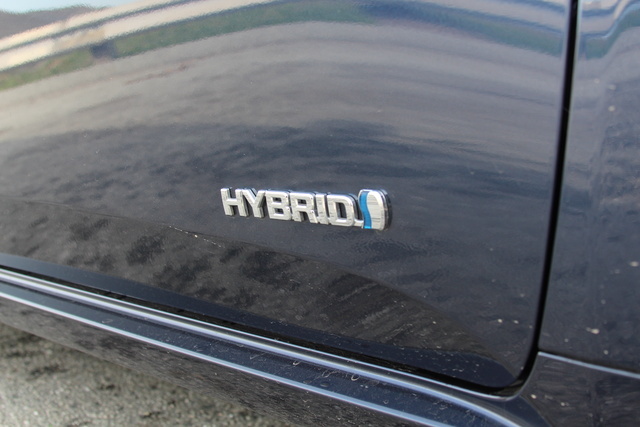 When looking at a hybrid, cost-effectiveness must be balanced by estimated cost savings with regard to fuel against the premium you’ll pay at the outset versus the gasoline version. Here, the EPA estimates a savings of $3,500 over 5 years of ownership versus the average new vehicle, a figure that will certainly drop over the next 5 years as average fleet fuel economy continues to rise to meet federal standards. Versus the $40,450 MSRP of a gasoline Avalon in Limited trim, the Avalon Hybrid Limited is an additional $1,500. Of course, you’ll also have to consider resale value after 5 years, which should be affected by the aging batteries, although the Avalon Hybrid currently enjoys class-leading resale and reliability ratings. The Avalon's competition includes the Buick LaCrosse Hybrid, which offers a less-efficient hybrid system, but more luxury and a better ride at a lower price, and the Ford Fusion Hybrid, which handles even better with a bit less luxury at a much lower price. 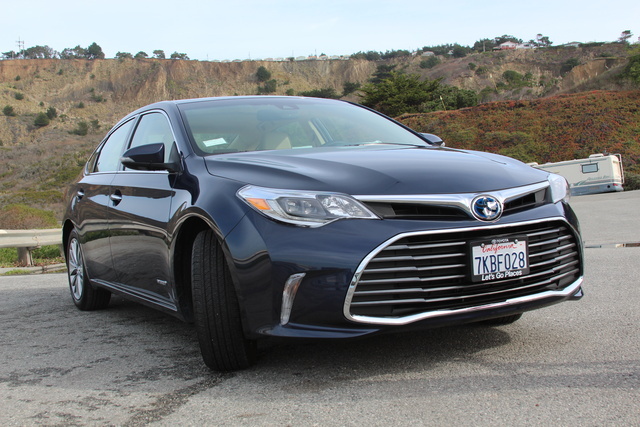 What's your take on the 2016 Toyota Avalon? Users ranked 2016 Toyota Avalon against other cars which they drove/owned. Each ranking was based on 9 categories. Here is the summary of top rankings. Have you driven a 2016 Toyota Avalon? What's The Difference Between 2016 Avalon Limited And 2017 Avalon Limited? I'd like to know of the main upgrades from 2016 to 2017 on the Toyota Avalon limited models. Wife thinks (doesn't like) the front passenger seat is not comfy, especially on long trips. Can I replace it with one from a Lexus or some other seat?